But without having a winning innovation culture to make your people cooperate, be agile, learn fast and deal with uncertainties, you will still miss out. The topic of culture and innovation was addressed during the 7th annual Ambassadors of Innovation event organized by Philips Innovation Services – Industry Consulting in Eindhoven, the Netherlands. Three speakers from very different companies – Amarant, Lamb Weston / Meijer, and Philips – shared their experience on how to build and nourish a culture to deliver innovative value propositions with winning business models. The Ambassadors of Innovation is an annual event for leaders who are responsible for innovation in large Dutch industrial companies and is organized by Philips Innovation Services – Industry Consulting. Before the gathering we surveyed the participants on innovation culture aspects. See how these companies that have put innovation in the forefront of their activities and continuously drive innovation do on these innovation culture aspects [figure 1]. And more interestingly, how would you rank compared to these companies that lead in innovation? Note: these questions are part of a larger survey we conduct in organizations to create a picture of the innovation culture, its strengths to build upon further and the areas of attention to address. We use this as part of an initial diagnostic. If you are interested in a further dialogue on innovation culture and increasing the innovation capacity of your organization please let us know. So what are the initiatives that management can take to improve developing winning value propositions and business models by enhancing the culture of Innovation? It integrates marketing technology and process innovation with ‘social innovation’. It entails a planned improvement of the skills and mindset to innovate. It encourages collaboration within teams, between departments, and with the outside world to achieve an ecosystem of innovation. It empowers people to drive small and large initiatives and remove traditional barriers. Culture cannot be pushed upon people and organizations. Culture needs to be pulled. That means that management needs to set stretched targets. But setting stretched targets is not enough. You need to stimulate to think in new ways. Just asking more sales and growth is not sufficient. By doing that your teams will not be challenged to think in new business models, use of digital innovation to create new value, or experiment and adopt artificial intelligence and machine learning in their value propositions or internal processes. The survey shows that leading companies almost always or often stimulate this type of thinking. A good example was given By Jan Vermeulen, Senior Vice President and Head of Imaging & DI Customer Services at Philips. He set a very stretching target and one that was publicly visible: to have a new solution introduced at the RSNA (an international forum of the society of radiologists, medical physicists and other medical professionals). This new solution PerformanceBridge, is not the incremental continuation of service portals or software. It envisions to empower hospital departments by providing a flexible suite of continuous improvement solutions. These provide a path to help hospitals find and maximize opportunities for doing more with less while at the same helping them to focus on patient care. So, the Philips Customer Services organization needed to start to look at things in a different way. Not just service, not just software, not just consulting. Jan Vermeulen challenged the team to take a holistic look at the customer’s need and come up with new ways to address them. New ways that included service, software, consulting, but also connectivity, IoT (Internet of Things), data analytics and new business models. In athletics you may be able to jump a centimeter or two higher by just trying more, but if you want a go from 2 to 5 meters you need to change your capabilities and assets by starting to use a pole to catapult yourself. Here again over 80% of these companies that lead in innovation do this always of often in their organization. New innovation capabilities can be both in terms of technical or other competencies, but also in approaches, ways of working and processes. Many companies go from products to services and solutions, and as software plays a larger role in the value propositions. Therefore innovating in agile ways or with lean start-up approaches for areas that are beyond the core business are capabilities that often come up as new capabilities to be mastered by organizations. Especially there where they need to interplay with the traditional ways of innovating. Here all three speakers had examples. New go-to-market capabilities for value propositions that are beyond maintenance services at Philips. But also developing the proposition in an agile way. At Lamb Weston / Meijer, new capabilities in big data for e.g., transparency in supply chain to consumers in the Trace My Fries℠ initiative. And at Amarant, areas like home automation, robotics or e-learning in a new innovation center – Innovatiecentrum Imagine – where parties can collaborate. Setting targets and making them stretched is one thing. When teams go out of their way to achieve the goals and build new capabilities, management must support this in both words and actions. Here as well, Jan Vermeulen had a good example. He explained that he had made the priority very clear by publically stating a stretched goal. Because resources were scarce – as they were already committed to other programs – it forced the team to reach out across organizational boundaries and successfully collaborate. This reaching out was fully supported by management which made sure to make these connections happen. In setting up PerformanceBridge, the team sourced resources and knowledge from over 10 different organization outside of their own business. Tapping into these other parts of the organization leveraged successful work and assets that already existed and that had been developed before by other organizations like Radiology Solutions. Encouraging the team to reach out turned a problem into an asset. Marc Bindels, Member of the Board of Amarant Groep, an organization that provides support, care and treatment to people with a limitation – ranging from light home support to highly intensive specialist care – shared some good examples on how that is done from the top of the organization. Teams in Amarant get together in so-called ‘rode draad’ (Dutch for common theme) meetings with patients and their families to address issues and opportunities in a collaborative manner. What these meetings lead to and how that is picked up is up to the team. The teams have the freedom to act. This has led to a number of very successful in initiatives. One of them is the development of a ‘blanket’ to be able to approach potentially violent patients in a way that is safe for the staff and that quickly calms the patients as they are cuddled by the staff using this blanket. A good check is to look at how things play out when teams do take risks and it does not lead to success. How is that perceived in the company, by management, by peers? If it is not seen as a success of learning and capability building then you may think you are providing freedom – but it is not perceived that way. Then you may want to look at the unwritten rules of the organization. Unwritten rules, that is ‘the way we do things around here’, e.g. the advice people would give to new colleagues on how best to get on in the organization. Ask yourself: If I would write down those unwritten rules, would people still take risks? If not, you will need to look to the underlying reasons of these rules and address them. Two areas that often come up are metrics and performance targets of people in the teams and the typical ways are to get promoted in the company. 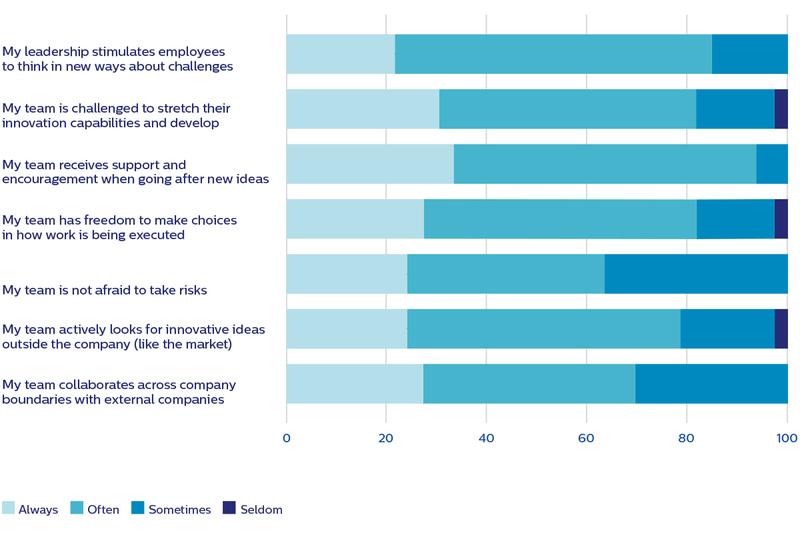 Interesting to see that even in the leading companies we surveyed, while 80% state that their teams have freedom to make choices in how they execute their work always or often, only 60% state that their teams are not afraid to take risks. A good way to make the culture more innovative is to open the windows for other cultures to come in. So actively searching for ideas on the outside and more generally embracing Open Innovation, not only allows you to tap into a much wider and deeper pool of ideas it also brings in new ways of doing things. Opening up the windows to look for new ideas is one, collaborating effectively across boundaries is another challenge. While most 80% actively look for external ideas always or often, collaborating seems more difficult, 67% doing this always or often. In the Total Innovation approach of Mike Vermeer of Lamb Weston / Meijer, the goal is to deliver solutions throughout the value chain. That means active participation and collaboration with all the value chain partners, be it farmers, suppliers of other ingredients, universities, technology suppliers or customers. A true open innovation approach from ‘fork to field’, starting with the consumer needs and working backwards up the value chain. This approach led to many successful innovations along the value chain. Innovations that were co-created with partners in the chain, be it in the area of precision agriculture, logistics, and IoT, new technologies for potato product shapes that command a higher premium, or innovations to open new markets, with the convenience that thus far was not part of the addressable market because of product performance needs. 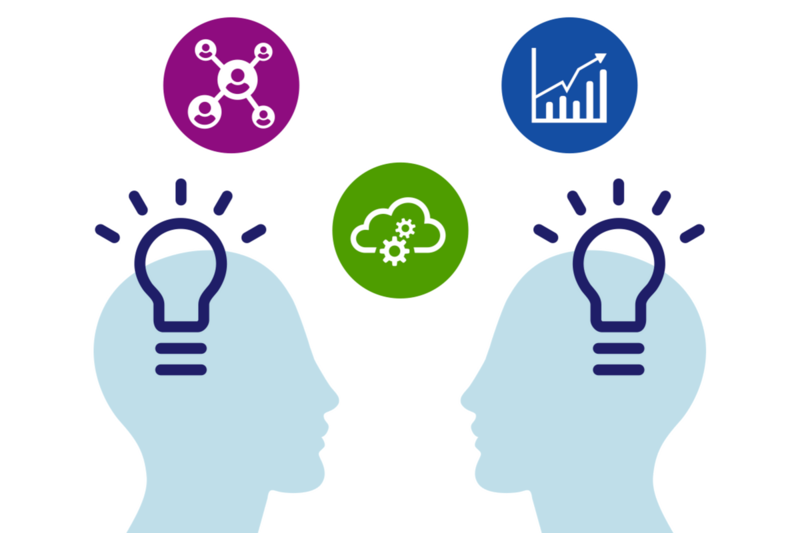 Are you interested in how Philips Innovation Services can accelerate your innovation? Do you need to stimulate your innovation culture? Would you like to learn more about this topic, how Philips Innovation Services – Industry Consulting has supported culture change to build an open & dynamic innovation culture for other businesses and what we could do for yours? Looking for winning value propositions and business models?